Home » Film Blog » Iraivi  : In the shadow of arrogant men! 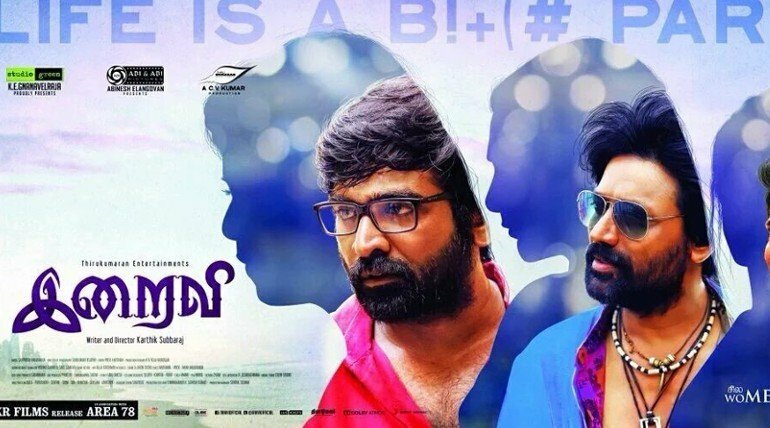 Iraivi  : In the shadow of arrogant men! Kartik Subbaraj is just 3 film old. With every film he has proven that he has a great knack for creating distinctive, well-rounded characters. He also weaves wonderful stories around them. Throwing into them a little bit of his own struggle to make films in the first place. In his sophomore effort ‘Jigarthanda’ he placed himself in Siddhartha’s shoes who played a film-maker forced to make a violent gangster film in order to make a film that he actually wants to make. Is Iraivi the film he actually wanted to make? While Jigarthanda is mostly remembered for Bobby Simha’s fabulous performance. There were some really sad and hard-hitting truths about the cinema of today. With Iraivi, Karthik delves into the life of women, while putting his entire focus on three men. His film is about three men who are not necessarily bad people. They are good people overpowered by their paranoia, guilt, ruthlessness and arrogance. While Kartik shows their descend through life, his main focus remains on the liberation of women. How women are the only ones who suffer the most in the name of male dominance. Iraivi (Goddess) starts and ends with rains. Rains are a sign of liberation and solitude and Kartik clearly knows where and how to use it. The film then moves on to three women talking about their ambitions, desires and disappointment respectively. We are then introduced to the three main male characters of the film. Arul (SJ Surya) is a movie director, a funny guy with a big heart who likes to drench himself in alcohol because his most awaited and beloved film has been shelved to be released by the producer. While he is a well respected name, his sudden outbursts are not doing him any good. His daughter and his wife are mere spectators of his self-loathing. Secondly, his brother Jagan (Bobby Simha) who is studying arts at a college and has a desire for Goddess sculptures that were build by his forefathers and have been set-up all across the country. He wishes to steal them and make profit out of them. The plot around Arul & Jagan also focuses on his father, who was once a ruthless fellow but has now mellowed down since his wife, who was never happy with him is in a coma. Thirdly the film also deals with Michael, an overly confused fellow who could do almost anything for his friends. He has fallen in love with Malar (Pooja Devariya) but she being an independent widow doesn’t want to get involved. He is forced to get married to which only makes this worse for him. The basic plot of Iraivi revolves around films, marriage and sculptor robbery which very aptly conceives together to give out a strong feminist message in the end. While there is a very interesting critic over film producers leaning their money heavy hands over pieces of art. There’s also a message about marriage being an act of ‘marrying’ only. Above all, Iraivi is about arrogant men making silly and least thought upon choices without thinking how it might effect the women concerned too. There are more than a half-dozen situations that are created by Subbharaj in order to send his central voice across. Iraivi is also about fate. How fate transforms ones life for the good. But mostly the bad trickles along and follows you home. The third act of Karthik’s film is heart-breaking and thought provoking at the same time. Kartik’s film’s biggest strength is how his male characters are not complete loathsome creatures. Even after their various fits of stupid decision making, you, along with the women in consideration, forgive them. It just makes it all the more difficult to cross them off completely. Also, even though there are so many characters to tackle, Subbharaj manages to give everyone ample of character moments. Which make them more relevant. The second half however, has some sub-plots that seem a tad bit distant and could have been shelved easily. The one involving the rehab to be specific didn’t really invoke the humor Kartik was trying to bring out. Also the complete mess surrounding the stealing of sculptures made the film less relevant. Iraivi features earth shattering performances all around. Specially Surya S.J. as Arul is a revelation. There’s not a single wrong note that goes into his work. All his alcoholic shamblings, random fits of anger and high-pitched ramblings on how films are being treated make him one of the most likable and vulnerable of the characters. Vijay Sethupathi as Michael is again brilliant. His fear, disappointments and pain all feel real. Bobby Simha who won a National award for Subbharaj’s Jigarthanda doesn’t get much to do in the first half. But instantly shines in the second half. All the women including Anjali, Kamalinee Mukherjee, Pooja Devariya all prove why this film is about them and not the men in question. Kartik Subbhraj’s Iraivi has a lot of commercial elements but it’s sheer eye and knack for telling a story that’s so relevant in today’s time, makes it stand out. It’s an enlightening, dark tale of how, often unknowingly, male arrogance hampers the liberation of women of all age and creed. Rustom : Mildly entertaining, wasted opportunity.